Renowned condo rights expert Dr. Joyce Starr presents the first self-defense guide for concerned or distraught Condo and Homeowner Association (HOA) members. Targeted as a condo whistle-blower over toxic mold, the author confronted and won a complex legal case. The author presents critical strategies for defending and protecting your rights. Discover how to stop Board abuse – including harassment, retaliation, and frivolous legal actions. 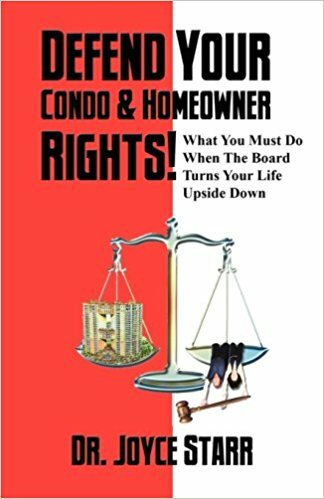 This book is your armor and shield if/when your condo board or HOA board turns your life upside down. We will email you a download link. Please provide a valid email address.